It’s been a good winter for northern birds, between the Bohemian Waxwings that have stopped to visit, and the Evening Grosbeaks that came by a few times early in the season. 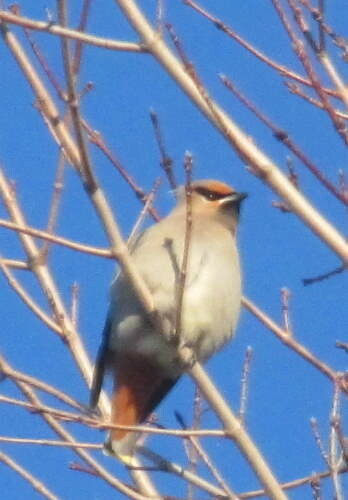 We didn’t see the grosbeaks again after those first visits, but the waxwings were semi-regular visitors over the winter. They move around an area, spending time first here, then there, so we’d see them daily for a few days or up to a week, and then they’d disappear for a few weeks, foraging in other spots. 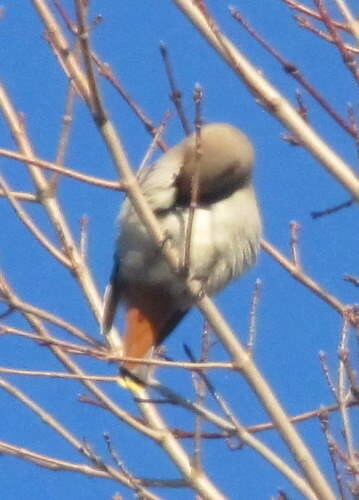 Earlier this week, we had a couple of days, back-to-back, where the waxwings stopped by again. On previous visits it had always been overcast, and the birds backlit against the cloudy sky. Hardly ideal photography conditions. This week, though, they paused in the big maples in our front yard, late in the afternoon with the sun slanting in at an angle that lit them up against a clear blue sky. They were pretty high, so it still wasn’t ideal, but it was considerably better than previous encounters I’ve had with them here. I used the super-zoom on Dan’s camera to get a few photos of these beauties while they were here, because how many more chances will I get this winter? Odds are, this is probably the last time we’ll see them until next winter. Soon they’ll start making their way north, following the advancing spring, till they reach their breeding territories up along Hudson Bay and points east and west. Bohemians have the distinctive habit of perching in flocks at the tip-tops of tall trees and just sitting there for minutes at a stretch, sometimes as long as ten or fifteen. They churr to each other, and preen, and doze, and hop about between branches, maybe move to the next tree for a bit. And then at some mysterious signal, they all decide they’re sufficiently rested to move on and they take off all at once. Even silent and backlit, this behaviour is enough for me to know what I’m looking at when I spot a flock of them. The first day they dropped by our front yard, the mysterious signal seemed to be linked to the fetching of my camera, but on the second afternoon they stayed for a little while. There were a couple dozen of them, but the only one that wasn’t tucked away behind some branches (at least from where I was standing in the house) was this individual. I can’t say I’m an expert on Bohemian Waxwings, but I believe this one is a female: the “bander’s bible”, an amazing tome filled with the sum of everything we know about bird moult and plumage, indicates that in female Bohemians the black chin gradually fades into the gray breast, while in males the black chin ends in a sharp line (like this photo, I guess?). It was nice of them to stop in one last time before they head north. I hope we see them again next winter! I am still enjoying your site because I love nature so much. As I have shared before, we here around Portland, Oregon have some of the same wildlife you have, Thanks for all the information you share and the work you put in to getting it. Thanks, Ivan; I’m glad to hear you’re enjoying it! There is a fair bit of overlap across the continent, though I have to say that Oregon’s got some beautiful nature unique to itself, too.